Update, 2:17 a.m: fire trucks gone, alarm off, all is well again Behind the Pink Wall! 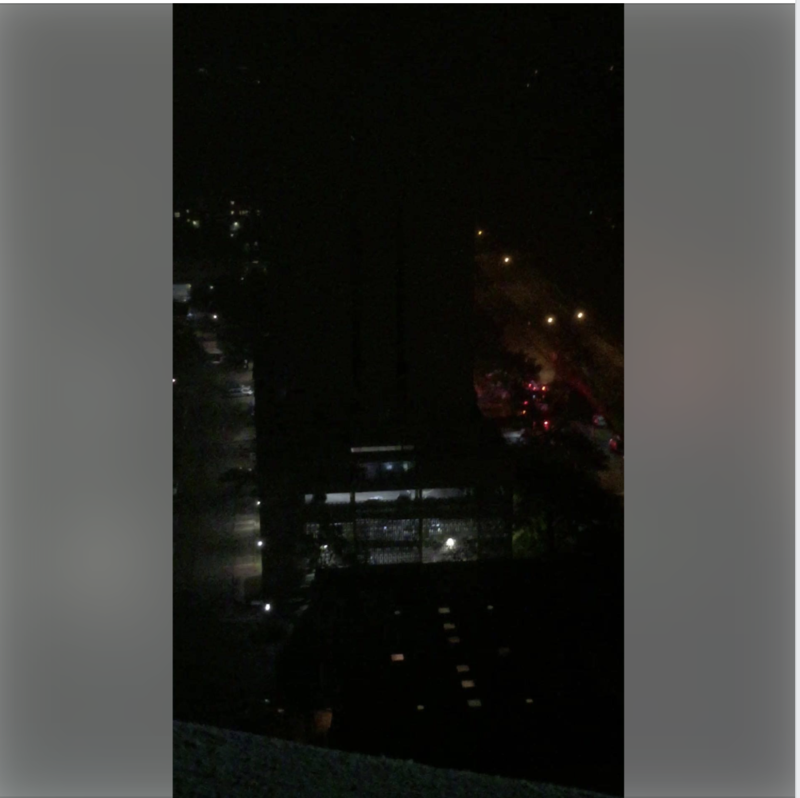 A friend who lives at Preston Towers tells me this is the scene right now at The Athena, where a loud sound is keeping everyone awake at 1:40am: hour 2 of The Athena’s fire alarm. Lord, I hope it’s nothing serious. 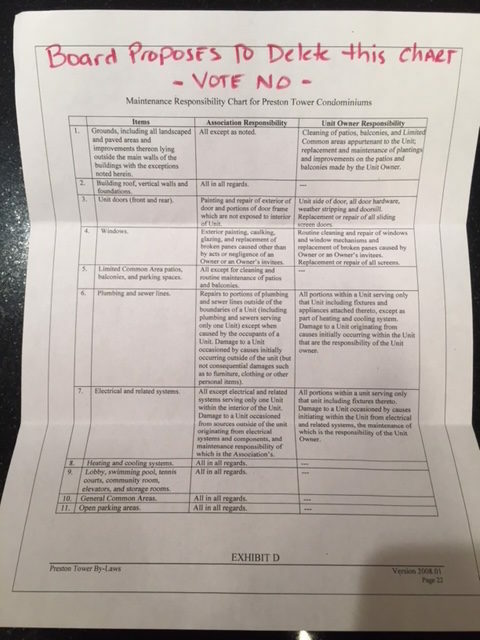 Preston Tower Apparently Wants to Shift Things Away from HOA and to Owners… Even Maintenance! This came across my desk today from whom, I don’t know. All I know is, it sounds kine of strange. 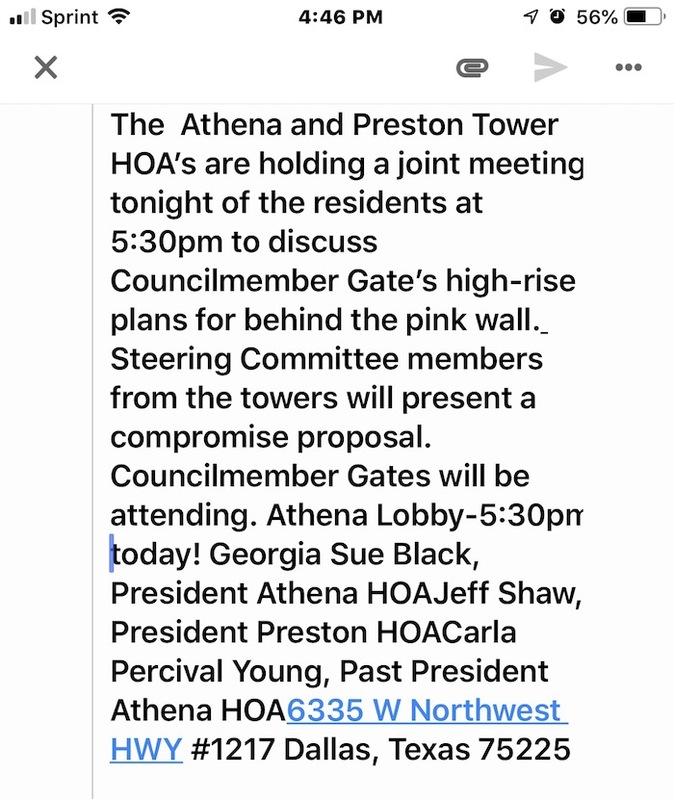 It sounds like Preston Tower, one of two condominium towers in the sizzling hot ‘hood at Northwest Highway and Preston, aka “Behind the Pink Wall”, wants to shift costs away from the HOA and onto the individual condo owners. Why would they be doing this? Preston Tower has had a number of lawsuits over the past few years, some of which they have lost. Perhaps this is an effort to shift costs and responsibilities back to the individual condo owners, says our Jon Anderson. But can they do this? 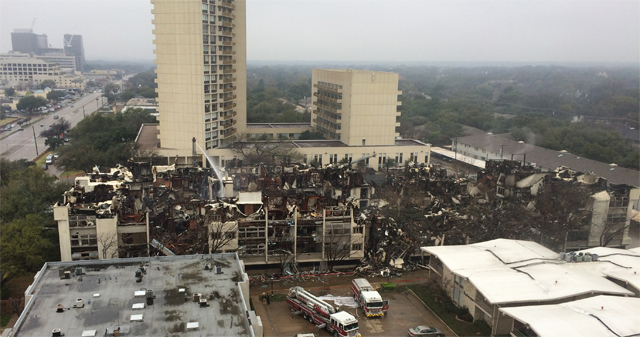 The 35 year old apartments at the corner of Preston and Northwest Highway are gone. 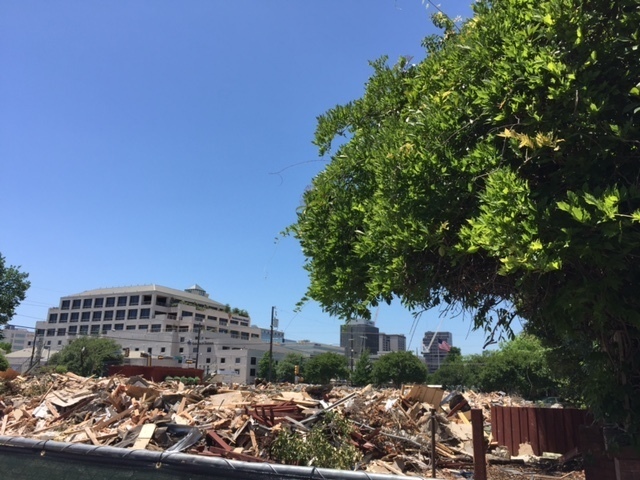 Late last week, the entire south block of Town House Row was gone. By the time I venture south today, the entire north side may be gone as well. Every time I drive by this portion of Preston Center “Behind The Pink Wall”, I say a silent prayer for the miracle that Transwestern actually did get to proceed ahead with it’s plans to raze these town homes — charming as they were — and fill them with luxury apartments. New luxury apartments filled with fresh air. I say this even though we are in the midst of Preservation Month. Several sources have overheard that some of the “natives” are getting restless behind the Pink Wall. 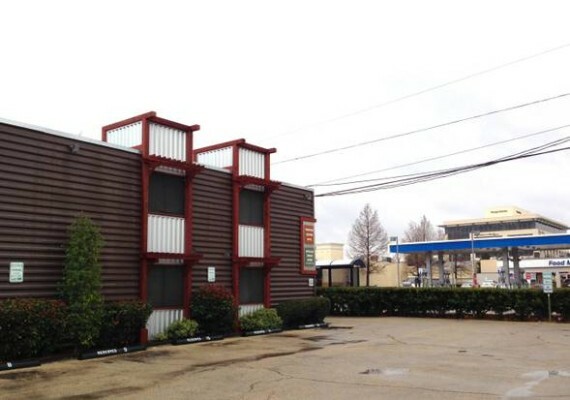 Specifically that the two neighboring condo buildings at 6307 and 6306 Diamond Head Circle (Royal Orleans and Diplomat) were seeking an agent to market the properties to developers. 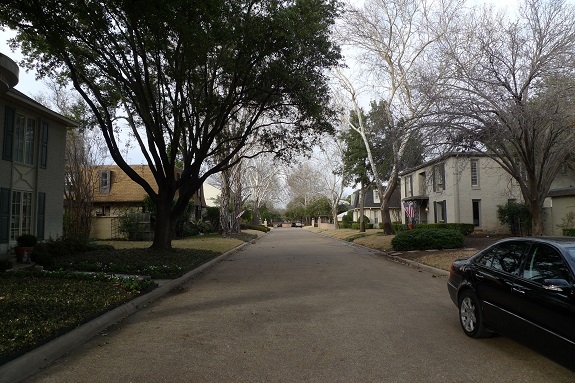 One source said a developer (Providence, folks who brought us Preston Hollow Village) had made an offer of $110 per square foot for the Diplomat complex of 14 units sitting on 41,349 square feet of land ($4.55 million). It was rejected as being low-ball. For reference, it’s been rumored that an early Transwestern bid for its on again-off-again-on- again project on the corner was at least 1/3 more. Tract 4, known as Royal Orleans, with Northwest Highway frontage, has 20-units on 43,994 square feet with underground parking. I am not aware of any bids on this parcel.